You are here: Home / Jewelry / Engagement rings / Lookalikes: Scarlett Johnansson’s engagement ring. Lookalikes: Scarlett Johnansson’s engagement ring. If you read the internet much, you’ve probably seen blurry photos of Scarlett Johnansson’s engagement ring by now. 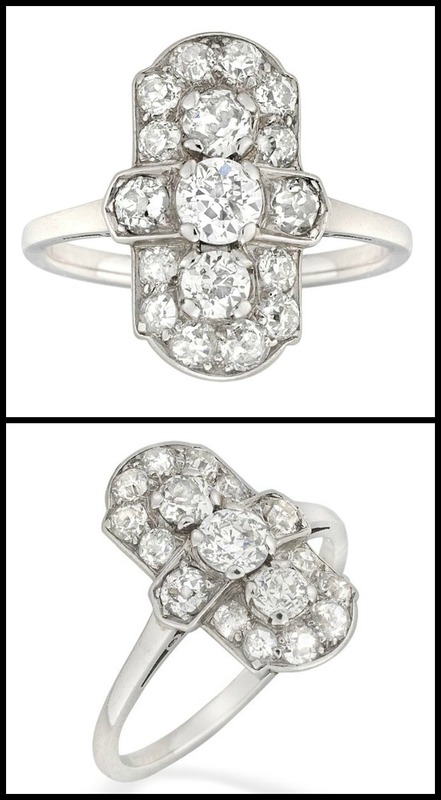 It’s beautiful: a long Art Deco ring with three larger diamonds set in a rectangular diamond-adorned plaque. It is glorious, and I fully support her slightly nontraditional choice of a dinner ring rather than a standard engagement ring. Also, I love using this photo because it shows her wearing a fabulous Bulgari necklace which I blogged about months ago. Way to listen, ScarJo. I fully support thinking outside the jewelry box, especially if it involves under-appreciated antique designs. To this end, I’ve rounded up some lookalikes for Scarlett Johnansson’s engagement ring. Let’s start out with one that’s very similar. This streamlined beauty is from 1915. It’s not as boldly geometric overall as Scarlett Johnansson’s engagement ring, but it shares the rectangular shape and north-south design with three large diamonds surrounded by smaller stones. 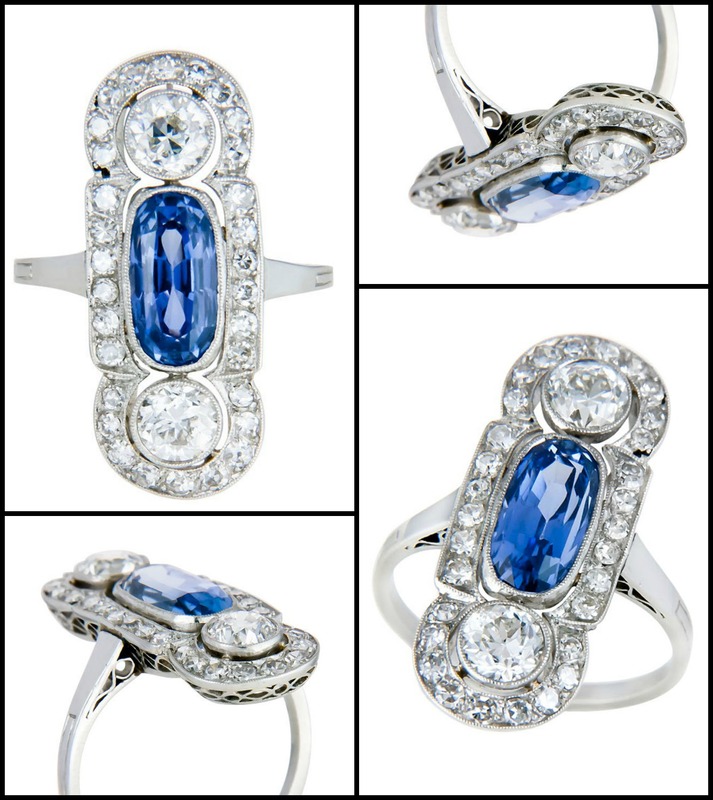 This antique ring adds a splash of color with a vivid sapphire as the central stone. It’s Edwardian, which is slightly older than Scarlett Johnansson’s engagement ring is believed to be. The 1 carat Ceylon sapphire is flanked by two old European cut diamonds totaling just under a carat and surrounded by a carat of smaller old European cut diamonds. Here’s a regal beauty. 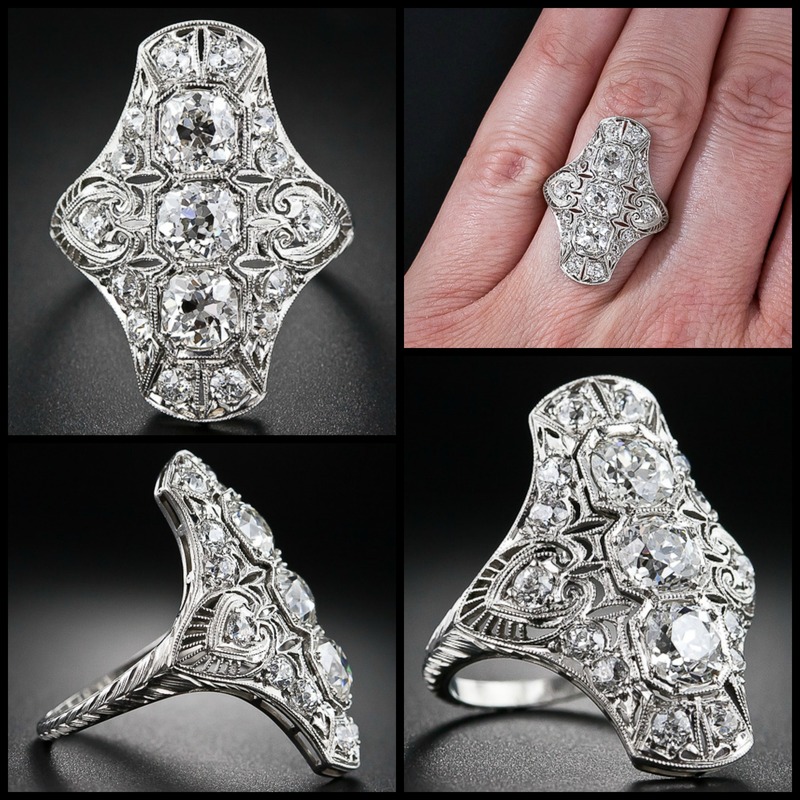 This Art Deco cluster ring is from the 1930’s, and features one large diamond flanked by two slightly smaller ones and set into a diamond-enhanced plaque, just like Scarlett Johnansson’s engagement ring. This is more complex than ring #2; the frame has several minute details that enhance its overall appearance of luxury. It also has more curves in its design than ScarJo’s. I think it’s marvelous. 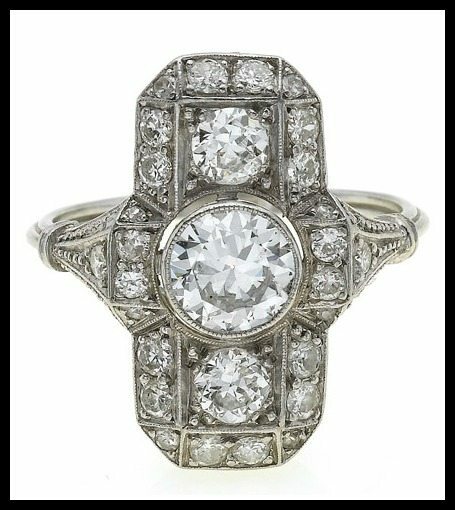 This Art Deco platinum and diamond ring is from 1925, and stars an old European cut diamond flanked by two mine cuts and surrounded by a number of smaller stones. With its filigree and openwork details, this piece is a bit more ornate than Scarlett Johnansson’s engagement ring – the overall shape and pattern of three large diamonds in the center are what earned it its place in this roundup. Last, but far from least, we have this incredibly fabulous option. 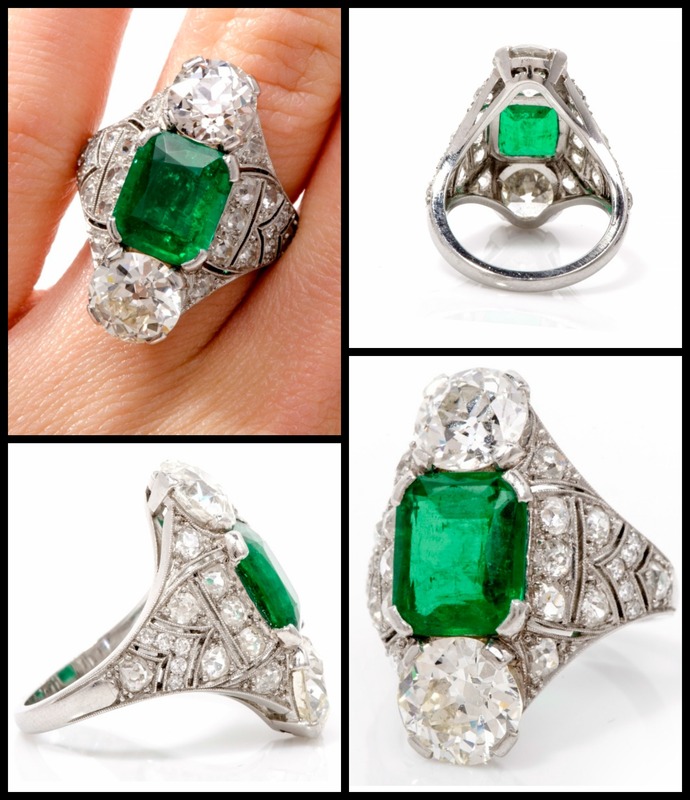 This antique Art Deco ring features a 4 carat Colombian emerald flanked by two diamonds (one 2.07 cts, the other is approx. 1.85 cts) and accentuated by a further 3 carats of 26 sparkling old mine cut diamonds. The setting is platinum and pierced with openwork details. Which is your favorite? What do you think of using a ring this shape as an engagement ring? Would you ever do it? Also: What do you think she should do for a wedding band? All images and info in this post are thanks to different sources; please see individual descriptions for source links. Top image of Scarlett Johnansson’s engagement ring via E online. Gorgeous ring, and you asked exactly what I was thinking: what about her wedding band? I’d bet she gets a diamond band and wears it alone, without the engagement ring. Looking forward to seeing what ScarJo chooses! That would make sense to me too – although if I were her, I’d never want to take the engagement ring off. Maybe it’ll show up on her right hand for special occasions, even after the wedding? We’ll have to wait and see!